‘Oh no, here comes another early 40’s propaganda flick, cynically bankrolled by the war office or some steel magnate with the express point of influencing the American people into joining up and therefore helping the shareholders get a bumper dividend this year’ I thought to myself as I fired up my poor, slowly expiring DVD player. As it wheezed into life, barked at me and finally did its thing after being turned on and off 5 times I had one eye closed for what monstrosity I was about to witness. As my screen lit up I was left wondering if this was indeed another lumbering, ill-conceived Frankenstein along the lines of ‘The Fighting 69th’. Or would this be a gem, would I marvel as a story of untold beauty unfurled its’ wings before me and took flight? It didn’t take long to realise it fell distinctly into the first camp. Bugger. I was hoping for something good but the Great War Films gods (the ghosts of Abel Gance, Richard Attenborough and Stanley Kubrick) were against me this day. I had 2 and a quarter hours to sit through another puff piece/revisionist historical rewrite of the life of a good ol’ boy who done good and single handedly won the war. Guff. Let’s start with the accents. I have no idea how people spoke in the early 20th Century in the middle of Absolute Nowhere, USA and it may well have been acceptable to contemporary audiences, but the dialogue throughout this film just sounds ridiculous. For want of a better example I can only think of Cleatus in the Simpsons as a suitable comparison. I suppose this is the point and that was how it was. What am I trying to say? I suppose just that I found it annoying and hard to follow. I sure-reckon I dun-immediately plumb-hated any-here character with a mighty-stupid accent a-fixing for a-doin’s. What? Our protagonist, Alvin York starts the film as a bit of a hell raiser, in that he fires a gun in the air and goes about a-whooping and a–hollering (to again, use the severely annoying vernacular of the film, I promise this is the last time) before being struck by lightning and finding God (face palm already and were only a few minutes in). He becomes a good guy and then at a turkey shooting competition he uses his unusual turkey mimicking skills and sharp shooting to kill some turkeys and draw attention to his gunmanship. What we are forced to endure after this plot set up is York trying to conscientiously object to fighting but giving in and thinking it’s a great idea after reading something in the bible. Oh Jeez, here we go again. Let’s tick off the propaganda motifs. 2nd World War era – Check. All American Hero – Check. Poor kid from the wrong side of the tracks – Check. Scant regard for historical accuracy – Check. Religion, religion religion – Check. Bible passage represented as fact to justify killing – Check. American kids in their droves running from cinemas to sign up for the war effort and subsequently being killed – Check. I shudder to think how many sons, brothers, fathers etc are lying dead in some foreign field as a direct result of films like this. The real life story of Alvin York is slightly different to that portrayed in the film. Warner Brothers, as paymasters and strident interventionists, had a clear agenda from the outset and took little regard with some of the details of Yorks’ life. The lightning strike/finding God moment did not happen, the death of a friend by a German soldier did not happen, he didn’t make the turkey noises to get the Germans to raise their heads and he didn’t have a fully paid for homestead awaiting his return from the conflict. The truths we are left with are cheapened by the sullying hands of the Warners executives. The film was well regarded at the time. Pearl Harbour had occurred during the period of its original cinematic release and the momentum had turned in favour of the Interventionists. It was the highest grossing film of 1941, and if inflation is taken into account, one of the highest grossing of all time. Modern reviews of the film call into question its overt interventionist stance. I would go a step further and suggest that this is a great example of how the media can manipulate public perception. We all think we are aware of this now in the 21st century but the techniques have advanced and we are all hoodwinked by the media in one way or another. As such this is a historically important film. Not because it is ‘culturally, historically or aesthetically significant’ but because it’s an example of what cinema, and media in general in the modern age, can do to us. How it can change us and have a detrimental effect upon us. 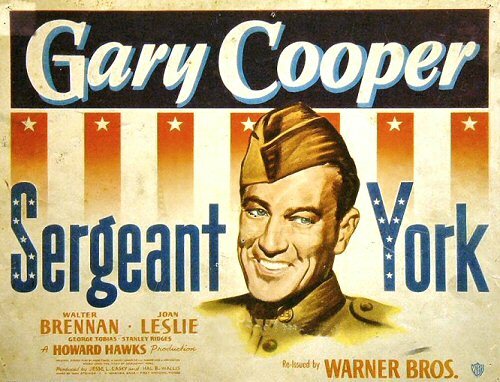 In conclusion, I hated Sergeant York. The accents were annoying, the pro-war message was overt from the outset and the religious stuff made me gag. If you get the chance to see this film, don’t. Give some money to charity, do some gardening for an elderly neighbour. Do anything good, for that is the only way anything positive can come from this film. Clicky Clicky to own a copy if you must. I have to disagree with you about ‘Sergeant York’. Firstly, set aside your irritation at the rural Tennessee accents, as they are interpreted by the excellent cast. That’s pretty well how those country folks spoke up in the mountains. I think you don’t understand the context in which this film was made. 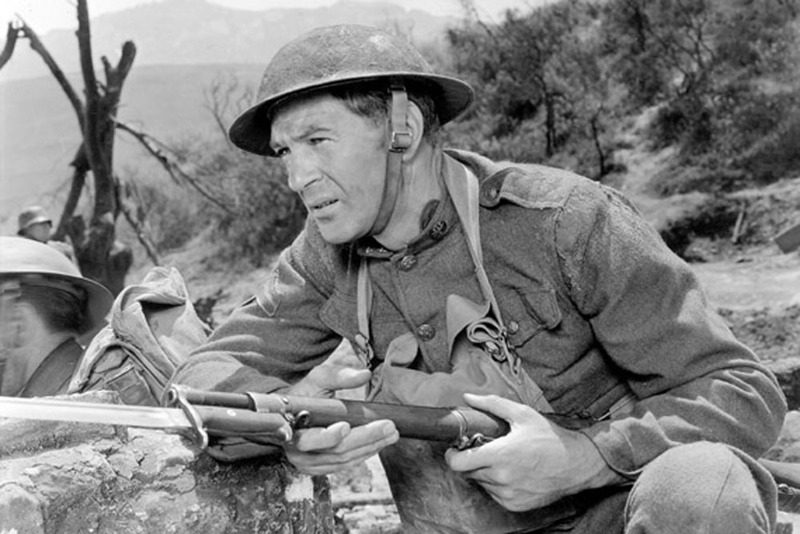 Directed by the versatile, highly respected and prolific Howard Hawks, the film’s theme is ostensibly about a change of heart in the pacifist Alvin York (Gary Cooper), the most highly decorated American soldier in WW1. But the underlying message of the film was a warning to America that a call to arms, a summoning to ‘righteous combat’, was looming. The film played an important part in the Warner Brothers campaign, headed by the Nazi-despising and highly principled Harry Warner, to enlist American support for the Allies against fascism on the eve of the USA’s entry into The Second World War. The Warner brothers, by the way, were of Polish-Jewish heritage. The real life Alvin York’s conversion from Bible-based conscientious objection to interventionism was the catalyst Americans in 1941 needed to see, in order to be convinced that the war in Europe was their concern. The isolationist mood which had gripped America shortly after the 1919 Versailles Conference’s machinations, and intensified during her post-First World War withdrawal from active participation in world leadership, was firmly set during the lead-up to the Second World War. The resultant internal problems of the Depression — social displacement, political unrest, burgeoning crime — were compounded by bitter memories of the huge losses of Great War. The national mood was opposed to overt U.S. involvement in the fragile and deteriorating political situation in Europe, as Italian Fascism and Nazism pushed outwards, against the boundaries and national entities and perceived injustices sanctioned by the victorious Allies at Versailles in 1919. Harry Warner stood out virtually alone amongst Hollywood’s moguls in opposing fascism and in preparing for an inevitable conflict with the nations who were espousing its noxious ideologies, while the American heartland clung to the belief that the growing crisis in Europe was not their affair. His first task was to persuade Alvin York, still a pacifist at heart notwithstanding his extraordinary heroics in France just over twenty years before, that the events in Europe mattered to Americans. York’s subsequent conversion to the need for America to mobilise its resources for an inevitable war foreshadowed the subtle changes that were changing the public’s mood. Thus the real life York, and the film of his First World War story of reluctant belligerence, were agents in Warner Brothers’ long campaign to marshal popular will towards mobilising the nation. As such, the film ‘Sergeant York’ made a definitive statement about the danger which total war, already raging in Europe, posed to the USA. It is certainly not an anti-war film, but rather a reluctant war film. 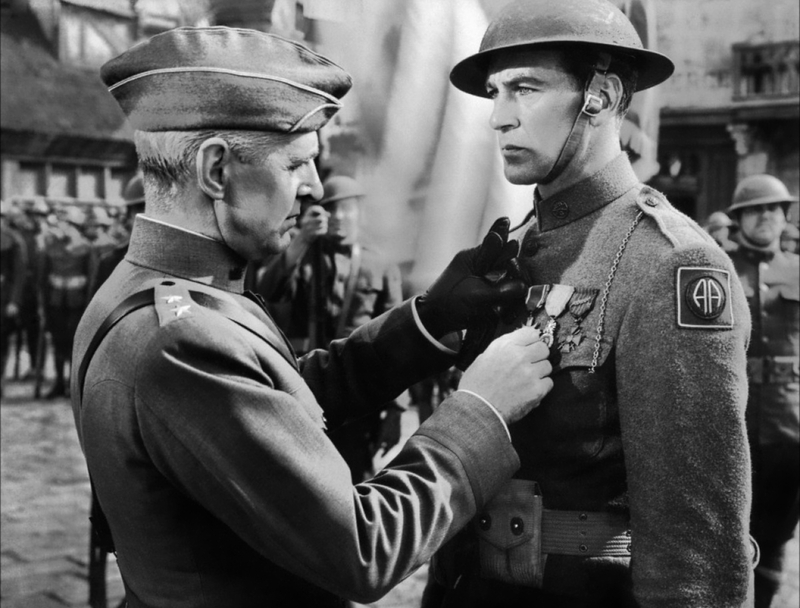 Ironically, Gary Cooper won the Oscar for Best Actor in 1941 for ‘Sergeant York’, twelve years after the passionately anti-war film ‘All Quiet on the Western Front’ had won the Oscar for Best Picture.’ America’s entry into the war followed, and the public mood was to change change again as the Second World War morphed into the Cold War.